This has nothing to do with cookies, but I am happy to report that shirataki noodles have made it to Austin. I’d been looking for them for months, and finally found some this morning at Whole Foods. 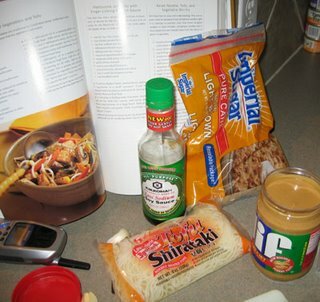 This is my attempt at making Shirataki Noodles with Peanut Sauce. Whole Foods sells a brand called “House” . One 8 ounce bag of shirataki noodles contains 40 calories which is about 1 cup of drained noodles. A serving size is exactly 1/2 cup. 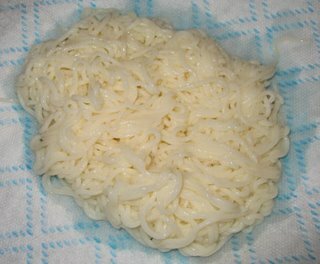 I think the most important thing to remember about Shirataki noodles is that they need a lot of rinsing and boiling to rid them of the stink. I rinsed them, boiled for a minute, then cooked them in a dry skillet for another minute or two. The sauce was great. As for the noodles, they were okay but will take some getting used to. The texture was interesting and only somewhat like pasta. I’m not quite sure I like them at this point, but at 40 calories per cup I might learn how. Open shirataki. Drain, rinse and boil for 3 minutes. The liquid stinks, so don’t get it on your hands. Boiling gets rid of the “natural” (icky) smell. After boiling, you may also cook them in a dry skillet (that is, if they still smell). 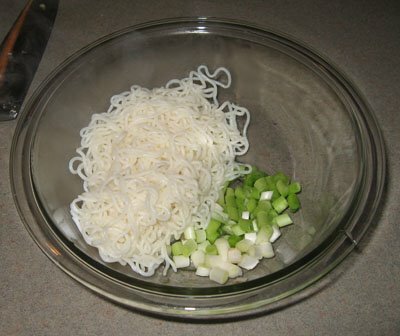 Place drained noodles in a bowl with the onions. Combine remaining ingredients in a small saucepan or in whatever you used to dry cook the noodles; Heat over medium and stir until smooth. Pour over noodles and onions and toss. 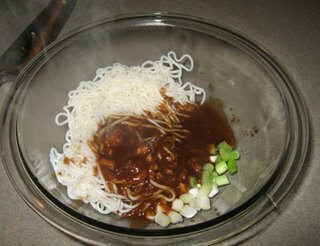 I love shirataki noodles! I’ve learned to both rinse and chop them before cooking, though. Off topic but impt: you looked GREAT on Oprah, never once lost your cool even when O was doing her I’m-so-stupid act. And fyi I live near, know your fellow Bake-Off friend Karen T, she said this week she ‘s ready to start blogging – she’ll be great, yes?!! Hi AK,Nice to hear from you! Karen and I talked about you at the Bake-Off. Thanks for the compliments about the O show. It was fun. Stefoodie, the smell is similar to fish. It had a mild fish sauce smell to it. Considering that I love peanut butter, I am excited about making these for a party on Saturday. Suggestions for other vegetables? I was thinking red bell pepper and carrots. Also, I’m going to try out the lemon cookies. Thanks for the recipe!What I really mean to comment about was the ‘stinky’ quality of the noodles. It has me wondering about a way to pre-cook or rinse the awful soy noodle bowl from last week. Food for thought, certainly. Abi, I hope you like them. Maybe you should make a test batch before you make it for party goers. I thought they were really tasty, but they are a little different than regular noodles. The sauce is definitely good. As for add-ins, I think blanched broccoli pieces and/or snow peas and carrots would be good. Have you tried using baking soda on the bowl? tg, I thought the cell phone would make it more Asian.Ali, what do you mean by “those kinds” of noodles? Have you tried the shiratakis already or do you just mean thin noodles in general?